We recently got out of the "record-breaking" shutdown that lasted 35 days. According to the Congressional Budget Office, just the direct costs to the U.S. economy are about $11 billion. Given that the 2013 shutdown (lasting 16 days), cost the U.S. economy about $24 billion in total, we can expect a sizeable indirect cost impact. A look at at mentions of "government shutdown" and "forecast" reveals an emerging trend. Given the size of the U.S. economy, the overall macro impact of this shutdown might be generally limited. But investors should be wary of how companies will be impacted, how they're reacting to the current situation, and if there are general trends that might impact the economy. This is where AlphaSense comes in handy. It allows you to quickly identify companies and industries which are the most vulnerable. One can also easily segment the results according to the source of the mention. This is crucial. Many company mentions are tied to necessary regulatory disclosures that won't always show clear impact of the shutdown. In this article I will only use mentions from transcripts where the management gives their take on the situation. Looking at the spikes in mentions this earnings season, it is likely the number will eventually surpass the 2013 mentions as the trend is not decreasing. 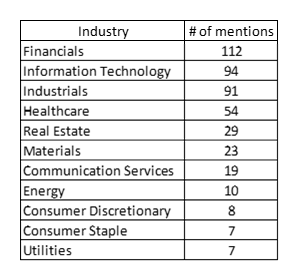 Through the search, you can easily identify which sector talked about the shutdown the most. The commercial and investment banks were asked about the shutdown the most, however they usually said the impact on their business is not overly material. They also added that while the uncertainty in the markets is far from ideal, they are not expecting a prolonged negative effect. One notable exception were investment companies focused on mortgages which mentioned that the spreads on agency mortgage-backed securities have widened which impacted their results. While the IT sector was only second in mentions, the impact was a lot more visible. Booz Allen Hamilton noted revenue impact as their core contracting business is tied to the government. Flir Systems also mentioned revenue impacts which they connected to delays in obtaining licenses. This then slowed down the whole supply chain. Industrials also noted the impact on revenue and delays. Here it was mostly the airlines that generate a portion of the business from functioning government. Delta Air Lines pointed out $25 million revenue impact per month. They also mentioned the start of their new Airbus A220 was significantly delayed as FAA was impacted by the shutdown. (AlphaSense users can view the search here). However, probably the most important impact of the shutdown was visible in the healthcare sector. Specifically, in the case of DaVita which is trying to close a $4.3 billion deal with UnitedHealth Group for a large part of DaVita’s business. The closing of the deal was significantly prolonged and pushed the management’s expectations past their original estimate in the wake of the shutdown. (AlphaSense users can view the search here). As you can see, the reactions to the shutdown varied. Companies were probably not as stressed as in 2013 due to the fact the shutdown occurred over funding for national security, and not over individual items on the broader U.S. budget. The revenue impacts and delays were there, but companies hope the remainder of 2019 should not pose a significant challenge. That is, if there is not going to be another shutdown. Want to learn more about how to improve your market intelligence strategy? Download our guide Better Market Intelligence With Smart Search to get a closer look at how augmenting your efforts with Smart Search technology can result in more proactive market intelligence, allowing you to access relevant, high-quality data points with speed and efficiency.